Have a fractious cat that you need to sedate? Want to consider using an epidural for a feline urethral obstruction (FUO)? Dr. Jane Quandt, DVM, DACVA, DACVECC, discusses some great anesthesia and pre-medication tips for cats. 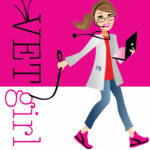 Today's VETgirl podcast interviews Dr. Quandt for some fast, efficient, helpful tips that every veterinary practitioner must review! I was curious about using hydromorphone with cats and the concern of hyperthermia? BTW, I talked to Dr. Quandt and have an interesting update. About 3-4 years ago, there was a paper in VAA that stated that those cats that had hyperthermia secondary to hydromorphone were often HYPOthermic during anesthesia. The key thing to take away is to not be scared of hydromorphone use in cats, but rather to carefully monitor your patient’s temperature after anesthesia… particularly if they were hypothermic. The opioids affect the hypothalamus and ability to thermoregulate.